If you’ve been looking at Nespresso machines, you have no doubt started to feel overwhelmed at the sheer number of options that are available. Nespresso has an impressive catalogue of choices when it comes to their machines, but when it comes down to it, they all do the same thing – brew espresso. Many of the machines from Nespresso are extremely simple to use. As a matter of fact, a lot of them only have one button operation. This is a great thing on those hurried mornings as you won’t have to remember a bunch of different settings to get to the drink you are trying to make for yourself. Most Nespresso machines are fast, being ready to make a shot of espresso in a matter of seconds. They offer a wide range of flavors and strength profiles to please almost anyone’s taste preferences. 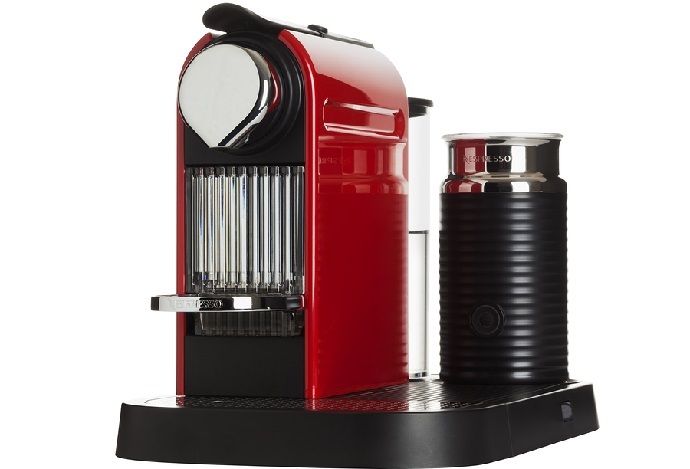 In the original line of Nespresso machines, our pick is the Nespresso Essenza Mini Original Espresso Machine. This machine is compact, but it still packs a good punch. Don’t let its small size deter you, this little guy can make all the lungo and espressos that the bigger and more expensive Nespresso machines can. There is no need to drop hundreds more dollars on a different Nespresso machine if you don’t want to. 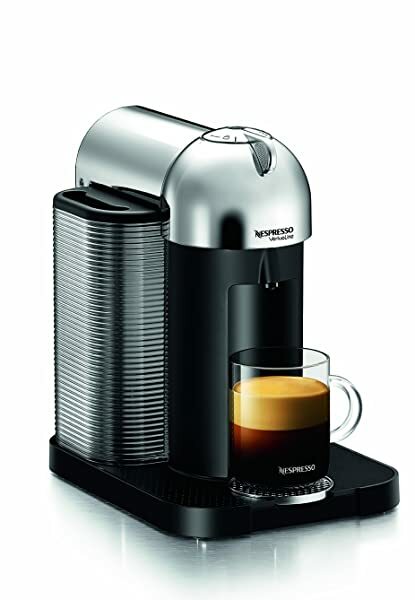 As for the Vertuo Line of Nespresso machines, our pick there is the Nespresso Vertuo Coffee And Espresso Machine/. This machine offers a lot because it is a two-in-one machine that makes both espresso and regular drip coffee. Whatever your morning drink needs, Nespresso has got you covered with just about anything you can imagine. Made from a design by DeLonghi, the compact design of the Nespresso Essenza Mini Original Espresso machine is our top pick when it comes to Nespresso machines. The sleek design features plenty of curves and rounded edges, and the machine has a tiny footprint of 8 x 12 x 4 inches. Weighing in at a mere five pounds, this little machine can go just about anywhere with you. You no longer have to suffer with terrible hotel or office coffee when you’ve got the Nespresso Essenza Mini. The removable water tank has a capacity of 20 ounces, ensuring you can get several drinks pulled before having to refill the tank. The machine can hold five or six used Nespresso capsules as well, so you don’t need to empty it each time you use it. The machine heats quickly, reaching temperature in just under 30 seconds. The high-pressured 19 bar pump prepares a shot that will seem like it came from a well trained barista. It works to extract the flavors and aromas of each Nespresso capsule, delivering them into your cup for your enjoyment. The machine can be programed to prepare two different sized cups, the espresso and the lungo, allowing you to get your caffeine fix in multiple amounts. The power save mode of the Nespresso Essenza Mini allows you to save energy as well. After nine minutes of inactivity, the machine will switch off the power. As a welcome gift, you will also receive a set of 16 different Nespresso capsules to try. There are a wide variety of flavors and you are sure to find a new favorite. This is a two in one machine, as it can brew both regular drip coffee as well as make an espresso. Included accessories make it possible to make other specialty drinks like a cappuccino or a latte as well. While the Nespresso Vertuo is not a compact machine, it certainly isn’t the largest out there on the market, either. With a 9 x 12 x 12 inch footprint and a weight of 11 pounds, this machine is still pretty portable. The water tank holds a whopping 54 ounces of water and it is removable. This makes for easy refills and easy cleaning. The size of the tank also ensure that you are not refilling it daily. The machine can also store up to 17 used capsules, so you won’t have to empty it every time you use it. After 15-20 seconds of preheating time, you can easily brew your drink with the touch of a single button. 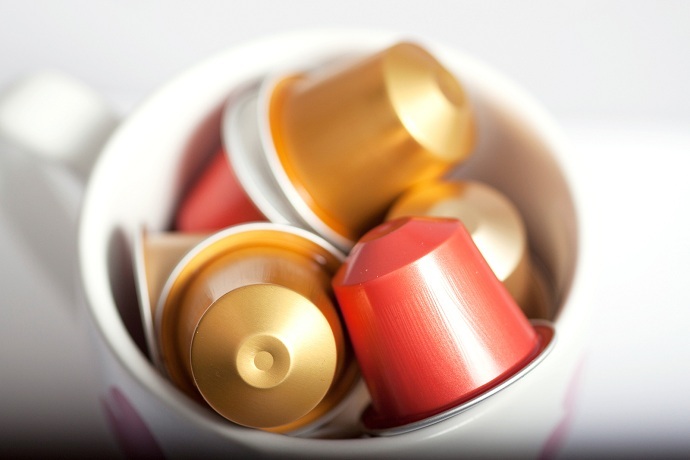 The Vertuo Line capsules seal the coffee flavor and aroma inside aluminum capsules that can be recycled. When prepared, this coffee will taste as fresh as the day it was sealed. The Nespresso Vertuo can make several different cup sizes as well. Choose from the 1.35oz espresso, the 2.7oz double espresso, the 5oz gran lungo, the 7.7oz coffee or the 14oz alto. Included in this bundle is the Aeroccino 3 milk frother. This attachment allows you to create barista worthy drinks in the comfort of your home. Learn to make cappuccinos and lattes and you’ll save a ton of money by not going in the coffee shops! As always, you will receive the kit of Nespresso capsules so that you can find a new favorite. If you’re looking for an espresso machine but worried about the amount of space it will take up, look no further than the Nespresso Pixie Original Espresso Machine made by Breville. While you won’t get a long list of features and special additions like there are available with some other options, this little machine is perfect for those among us who have tiny kitchens and almost no counter top space. One of the most compactly sized espresso machines available, the footprint of the Pixie is a mere 4.5 x 13 x 9 inches. It weighs only six pounds too, making it very portable. You can keep it in the office, take it to the hotel, or bring it to your in-law’s house so that you can have delicious Nespresso coffee anywhere. Because this machine is so small, you can’t expect a lot in the way of features. The water tank holds 24 ounces of water, and it is removable making for easy refilling and cleaning. The machine can also hold up to 11 used capsules so that you don’t have to empty it daily. 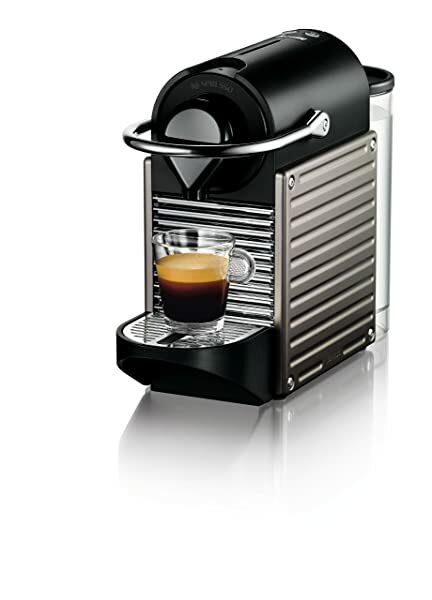 Another quick operator, the Nespresso Pixie preheats to the ideal espresso brewing temperature in just 25 seconds. The high-pressure 19 bar pump lets the machine pull a barista worthy shot of espresso while releasing all the flavors and aromas contained in the coffee. Though this machine is incredibly small, you can still choose between two different sized cups of coffee, the espresso or the lungo. To brew the size you want, you simply press the backlit button and the machine will reprogram itself once your cup is made. Again, you will get a welcome package with 16 different flavored Nespresso capsules to choose from, so you are sure to find one that you enjoy! 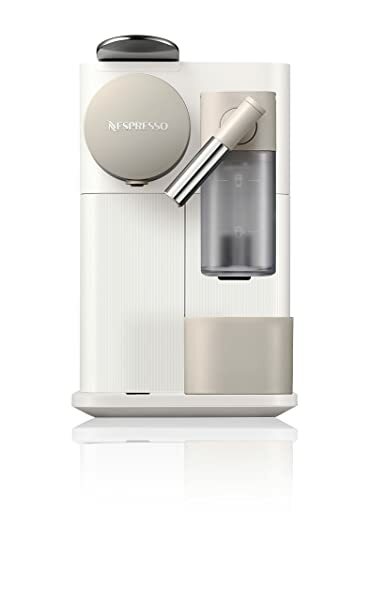 Yet another choice when it comes to compact machines from Nespresso, the Inissia Espresso Maker takes up little room but brews a powerful cup of espresso. There isn’t a ton of differentiation between these compact machines, so you really can’t go wrong with whichever one you choose to purchase for your use. 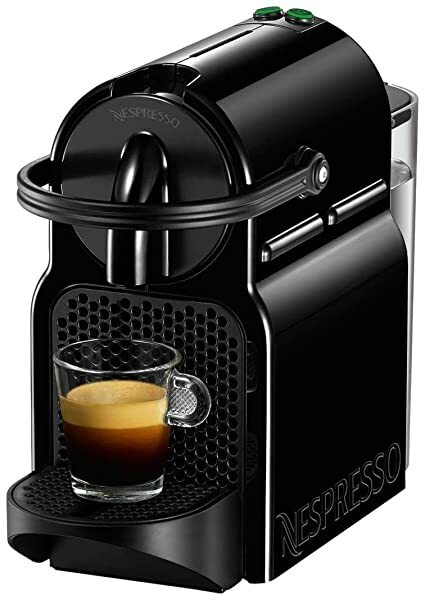 Needing only 5 x 9 x 13 inches of countertop space and weighing in at less than six pounds, this is another Nespresso machine you could easily take with you whenever you want good coffee. You can also get this machine in a variety of colors to suit your tastes. The water tank on the Inissia is removable making for easy cleaning and refills, and it can hold 24 ounces of water at a time. As for used Nespresso capsules, the Inissia holds up to 10 so you only have to empty it every few days. As with nearly all of Nespresso’s machines, this one preheats quickly, in 25 seconds. Using a 19 bar high pressure pump system and operated by a single touch, the Inissia will brew delicious espresso each and every time. The drip tray folds out of the way to accommodate larger sizes of cups, and the Inissia can make either an espresso or a lungo sized cup of coffee. This machine has an energy saving feature, automatically shutting of the power to the machine after nine minutes of not being used. This saves you energy as well as wear and tear on the Inissia. 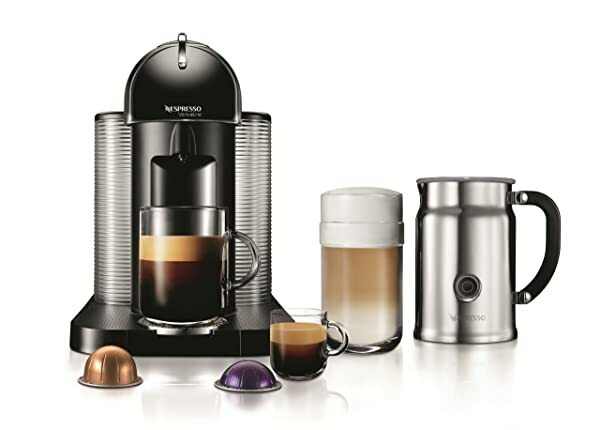 Just as they do with all of their machines, when you purchase the Inissia, Nespresso includes a welcome package containing a variety of Nespresso capsules to choose from for your enjoyment. In an urban kitchen there just isn’t much room for anything extra, but most people can’t get through their day without a coffee to start it. Thankfully the Nespresso CitiZ from DeLonghi is another compact offering and solves both of these problems. Needing a miniscule 5 x 15 x 11 inches of space, this machine takes up virtually no room. The seven pound weight makes it easy to move around when necessary, too. The compact design of this machine has even won an award for being user-friendly and innovative. The water tank holds up to 1L of water and can be easily removed to clean or refill. The CitiZ can also hold up to 11 used Nespresso capsules to save you from having to empty it every day. In 25 seconds, the machine is preheated and ready to get to work making your drink. The high pressure 19 bar pump system works to produce consistent cups each time, and you can expect the excellent flavor and aroma Nespresso is known for. The machine can make two different sizes of drinks, the espresso and the lungo. Simply fold back the drip tray and make your selection with a single touch. The built in Aeroccino 3 gives you the ability to make delicious milky drinks as well. Lattes and cappuccinos are now in your wheelhouse thanks to the CitiZ! The energy saving feature will automatically power of the machine after nine minutes of no activity, however you can adjust this up to thirty minutes if you prefer. This feature saves energy and saves you money. Nespresso provides a welcome set featuring 16 flavors of coffee in their recyclable aluminum pods. You can try them all so that you can find one that suits your tastes. If you’ve got a bit more space on your countertops and you’d like a machine that has more features, then perhaps the Nespresso Vertuo Line Coffee and Espresso Maker is the one for you. At 9 x 12 x 12 inches and nearly 11 pounds, this machine is definitely not a compact size. If you’ve got the space for it though, that shouldn’t be a problem. Plus, with the larger size you will benefit from it being a multi-use machine that has several features. The removable 40 ounce water tank is easy to clean and simple to refill. When you are through with your daily brew, your machine will hold up to 13 coffee and 20 Nespresso capsules, so you don’t have to empty it very often. In just 20 seconds your machine will be preheated and ready to prepare a delicious drink for you. The support for the cup is adjustable allowing you to brew multiple sizes. Choose from the 1.35oz espresso, the 8oz coffee or the 14oz alto. The machine is not complicated to operate, either. You can simply press a button and the machine will deliver the flavor and aroma you have been waiting for. The capsules for this machine offer a lot of variety as well. There are 12 different coffee selections and 4 espresso choices. Once sealed in the capsule, the coffees lose no flavor or aroma. When used they will be just as fresh as the day they were packaged. All of the capsules are made from recyclable aluminum, so you don’t have to worry about creating excessive waste. 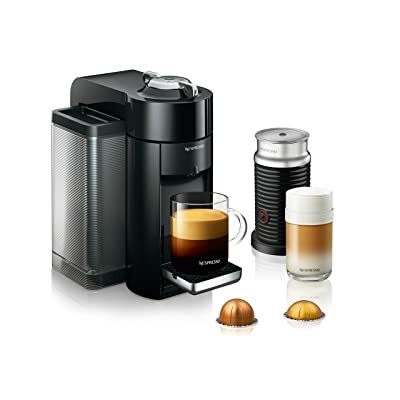 You’ll also receive the welcome set that Nespresso send with each new machine. This one contains 12 of the large Vertuo Nespresso capsules for you to sample and enjoy. If you’re after a Nespresso machine but you don’t need a tiny one, perhaps a mid-sized model is the right choice for you. We have no seen several compact models as well as a couple of larger ones. This model is also another two in one option, brewing both espresso and coffee. Taking up only 9 x 12 x 12 inches of space on the countertop and weighing in at 11 pounds, this model falls somewhere between the other two sizes and is a great middle of the road option. The water tank on this model holds up to 40 ounces of water and it is removable to allow for easier cleaning and filling. It can also hold up to 20 used espresso capsules or 13 used coffee capsules, so you can go a few days without emptying it. After taking 15 – 20 seconds to preheat the system, this Nespresso Vertuo Line machine is ready to go. With the touch of a single button, the machine brews espresso or coffee in several sizes. The cup support can move to hold cups for a 1.35oz espresso, an 8oz coffee or a 14oz alto drink. Nespresso’s capsules are of the finest quality and come in single serve portions. When inserted into the Vertuo Line of machines, the capsule spins over 7000 times while water flows through it. This process extracts excellent flavor and aroma from the coffee and delivers it into your cup to enjoy. Because this model can prepare both coffee and espresso, it uses two different sizes of capsules to do so. The smaller espresso capsule comes in 4 different strength choices and the larger coffee capsule has 12 varieties to choose from. It can be hard to decide, so Nespresso sends a welcome kit with your purchase and it contains 12 different capsules to try so that you can find one that you enjoy. The Lattissima Pro is sure to be a favorite with all the nuances of the Italian espresso great DeLonghi, but the simplicity of Nespresso capsules. It is easier than ever to create authentic Italian espresso at home thanks to the cooperation of these two companies. This is definitely not a compact machine and needs space to operate – sorry to all you tiny house dwellers out there! The machine weighs in at 13 pounds and you’ll need an area that measures around 11 x 8 x 13 to accommodate its size. The 44 ounce water tank is located out of the way at the rear of the machine and it is removable allowing for easy cleaning and refilling. This machine can also hold up to 16 used Nespresso capsules before it needs to be emptied. The Thermoblock heating system in the machine allows it to be heated and ready to create drinks in just a few seconds. With one touch, the 19 bar pump system draws all the flavor and aroma possible from the coffee before delivering it into your cup. You also won’t have to wait between cups, as the machine maintains the proper brewing temperature allowing you to brew back to back. While the shot is being pulled, the built in carafe is preparing the frothed milk and delivering it into your drink for a wonderful crema experience. The milk container is detachable, simply put it in the fridge until you are ready for your next drink. Additionally, no milk ever enters the system of your Lattissima machine, so you don’t have to worry about spoiled milk in the lines. Now you can enjoy espresso, ristretto, lungo, cappuccino and lattes at home – and it is easier than ever with this machine. 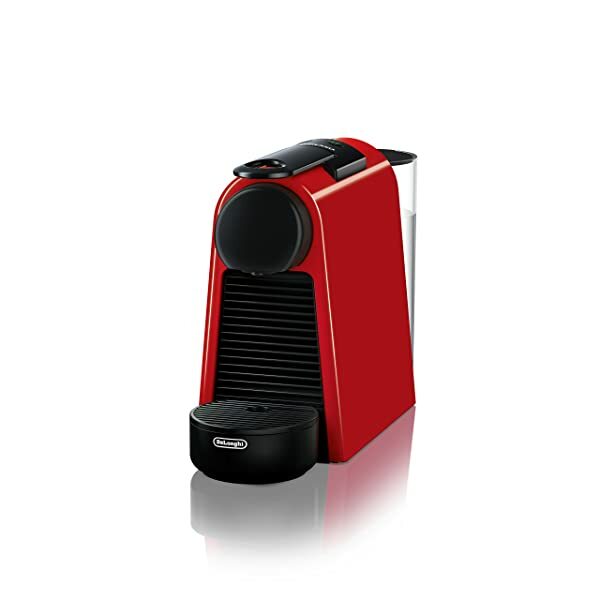 DeLonghi and Nespresso collaborated once again on this Lattissima machine, this time in the original design. When these two get together you know the end result is going to be beautiful and innovative, and that your morning drink is going to be amazing. You won’t need an exorbitant amount of room for this machine, as it only has a footprint of 7 x 13 x 10 inches and weighs in at 10 pounds. It is a decent mid-sized model and is suitable for a wide range of homes. Slightly smaller than its Pro cousin, the Lattissima Touch has a water tank that has a capacity of 30 ounces and it is removable for cleaning and refilling. 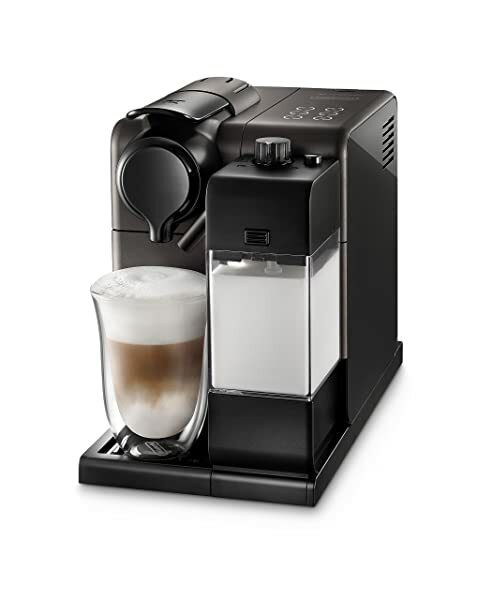 The machine can hold up to 13 used Nespresso capsules allowing you to go a few days before emptying it again. After preheating for 20 seconds, this machine uses 19 bars of pressure to prepare barista style drinks in your kitchen. You can choose between six options for your drink; a macchiato, an espresso, a ristretto, a lungo, a cappuccino, a latte or a hot milk. You can count on all the delicious flavor and enticing aroma being extracted from the Nespresso capsule, so you can savor it. The machine will also froth your milk and deliver the long lasting and rich foam into your drink. No guesswork for you either, as the Lattissima delivers just the right amount of foam depending on your drink selection. Additionally, no milk will ever enter the machine and the milk unit is dishwasher safe. This model is also available in two different finishes. You can choose between Black Titanium and Palladium Silver. Many people prefer the Vertuo Line of Nespresso machines, and DeLonghi is happy to work with Nespresso to create an exceptional at home experience with this Vertuo Plus Espresso machine. The machine is fairly hefty when it comes to weight, tipping the scales at nearly 25 pounds. It’s not too small when it comes to the amount of space it takes up, either. The 17 x 13 x 6 inch footprint isn’t exactly compact. Nonetheless, this machine is a favorite of many people. 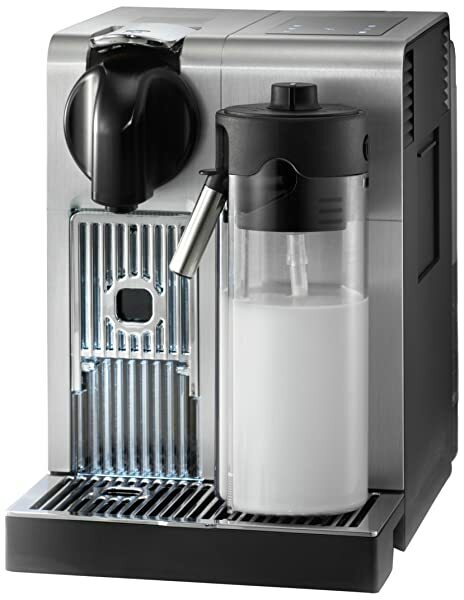 At a 40 ounce capacity, the removable water tank is a pretty standard size for a Nespresso machine. The water tank also has the ability to move so you get the most use of space on your counter. The tank can remain behind the machine, or it can swivel out to the side – whichever is best for you in your space. The container for used Nespresso capsules can hold up to 10 at a time before needing to be emptied. Another dual option machine, this one makes both coffee and espresso giving you choices depending on the day. Once it finishes taking 20 seconds to preheat, you can simply press the button and the machine’s 19 bars of pressure will go to work to extract the optimum amount of flavor and aroma from the Nespresso coffee or espresso capsule. Adjustable to four different positions, this machine can make multiple sizes when it comes to cups of coffee and espresso. You can choose from an espresso at 1.35oz, a double espresso at .27oz, a gran Lungo at 5oz, a coffee at 8oz or an alto at 14oz. Nespresso’s complimentary welcome kit is a favorite. Inside you will find 12 different Nespresso Vertuo capsules for your new machine. Try each one to find a new favorite! Another joining of Italian espresso machine maker DeLonghi and Nespresso have brought forth the Nespresso Lattissima One machine. Another offering that is in the middle when it comes to size, this espresso maker has several features to offer. This machine features an extremely clean and simple design that is sure to please even the pickiest among us. For counter space you will need an area that is 13 x 7 x 11 inches. The machine weighs in at just over nine pounds, so it’s not too terribly heavy, but it’s also not extremely portable like some others on our list. The water tank holds about 34 ounces of water, and it is removable making it easy to refill and simple to clean when necessary. The container for holding used capsules can hold 8 at a time, so you’ll only need to empty it every couple of days. In just 25 seconds the machine reaches the optimal temperature for brewing your espresso. Choose your size and the machine will prepare a barista style coffee using 19 bars of high pressure. This allows the machine to extract every bit of flavor and aroma from the capsule so that you get a delicious shot of espresso. With one touch, you can craft several specialty drinks as well. You can easily prepare cappuccinos and lattes in addition to the standard espresso and lungo drinks. There is also a milk button that allows you to utilize the fresh milk system and pour the perfectly frothed milk directly into your drink. As always, Nespresso’s capsules are filled with only the best coffee and then the freshness is tightly sealed in. You will receive a welcome kit from Nespresso containing 16 samples of their Nespresso coffee for you to try. If you like high-end design and have plenty of space on your counter top to accommodate it, then the Creatista Plus from Nespresso might be the right machine for you. The brushed stainless steel finish of this machine makes it look as though it belongs in a café, not an everyday kitchen. This machine is a larger model and as such it will take up more space in your kitchen. The area where you wish for it to stay needs to be about 17 x 7 x 13 inches. Surprisingly lightweight for its size, this machine only weighs about 11 pounds. This is definitely not a compact or portable machine. The high capacity 60 ounce water tank is extra-large, ensuring you won’t need to refill it often at all. The water tank is also removable, so you can easily fill it or clean it when needed. Once the Nespresso capsules have been used, the eject into the holding tank where 14 of them can be held at a time. This allows you to go a few days without needing to empty the machine. You’ll be enjoying your espresso in no time thanks to the fact that this machine takes a mere three seconds to preheat and be ready to prepare drinks. The 19 bar pump allows you to create coffee shop style drinks in the comfort of your own home, and you can be sure that all the aroma and flavor has been extracted from the Nespresso capsule for you. You can choose from eight different drinks to make, as well. Your choices are a black coffee like a ristretto, an espresso or a lungo, or a specialty milk based drink like a cappuccino, a latte, a macchiato or a flat white. You also get plenty of control when it comes to the froth of the milk. The expert steam pipe lets you choose from 11 different temperatures and 8 different textures for the froth. 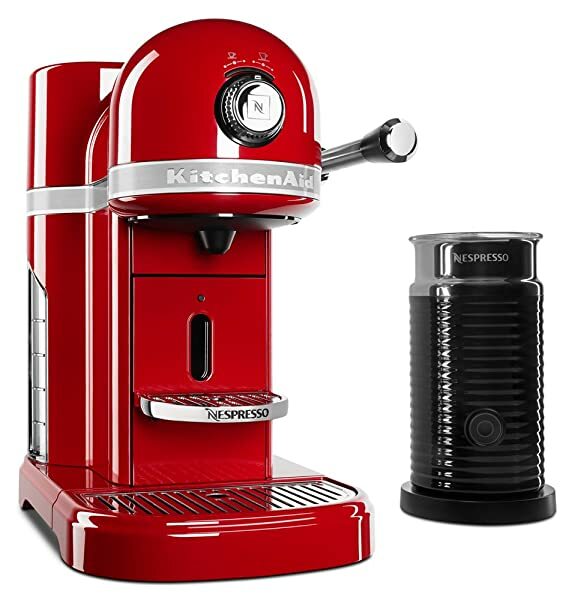 Both KitchenAid and Nespresso are known for their great kitchen products, so when they join together to bring you the KitchenAid KES0504ER, you know that you’re going to be getting something good. To make it even better, this model comes in KitchenAid’s classic Empire Red color. You won’t be getting a compact machine in this one. Made almost entirely from die cast steel, this machine weighs nearly 20 pounds. It needs an area measuring 13 x 9 x 13 in order to properly function. The removable water tank holds up to 44 ounces of water. Because it is removable, it is easier to refill and simpler to clean when the time comes. The used capsule container can hold up to 14 capsules, allowing you to wait a few days before emptying it into the garbage can. In under 30 seconds this machine will be preheated and ready to make some espresso for you to enjoy. Using the usual 19 bars this machine will use high pressure to extract the most flavor and aroma possible from each Nespresso capsule. You can choose from the 22 Nespresso capsules that are compatible with this machine and select one of the six flavor settings that are pre-programmed into the machine. The cup shelf folds away for convenience, and it also adjusts height to accommodate different sized cups. This model does not include a milk frother, so you’ll miss out on that froth and crema and can’t make specialty drinks like cappuccinos and lattes. If you’re a fan of straight black espresso though, this machine has a lot to offer. As with every purchase, Nespresso will send you your free welcome kit that contains 16 different Nespresso capsules to sample. You are sure to find a new favorite among them! Nonetheless, different people will have different preferences and different reasons for why they prefer the machine they use over all the others. That is fine, but you shouldn’t go into making such a large purchase without a good understanding of what you’re getting into. In this section we will be going over what you need to know about Nespresso machines in order to make an informed choice so that you choose the right machine for your needs. It is easy to get carried away or bamboozled by the machines that offer hundreds of futuristic gadgets, attachments and features. 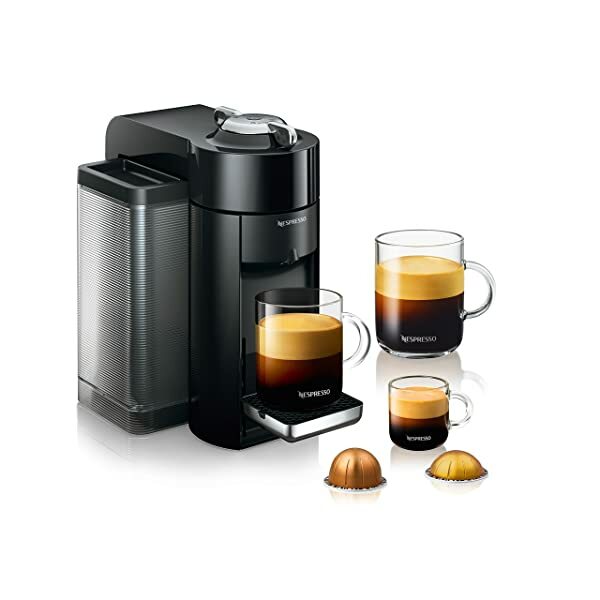 If you are just after a simple shot of espresso, don’t be swayed – Nespresso has just what you need. Time – Your mornings are already rushed, and it’s hard to add another task into them. One great benefit to using a Nespresso machine is that it takes virtually no time to warm up and be ready to brew your drink. Some take longer than others though, so look at that information while doing your research. On average, Nespresso machines are ready to go in less than a minute, usually somewhere between 20 and 40 seconds. 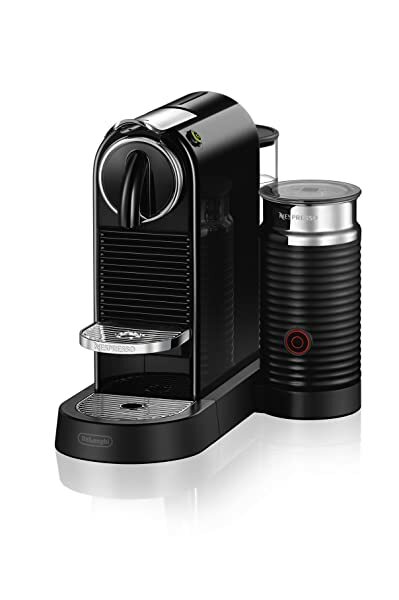 Capacity – Most Nespresso machines have two storage compartments, one being the water tank and the other being the container for the used capsules. Both of these will save you time. The large your water tank’s capacity, the less often you will have to fill it up. Additionally, if the tank is removable (most are), it will be easier to fill and simple to clean. The more spent capsules your machine can hold, the more time you can go between emptying it. 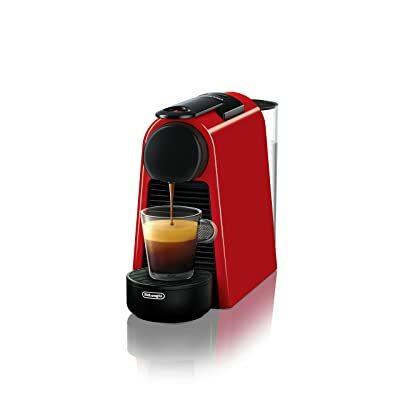 Ease of Use – Many of the machines from Nespresso are extremely simple to use. As a matter of fact, a lot of them only have one button operation. This is a great thing on those hurried mornings as you won’t have to remember a bunch of different settings to get to the drink you are trying to make for yourself. Customization – Some people just want a simple plain black shot of espresso, but other people want the fancy drinks like lattes and cappuccinos. No matter where you fall on that line, Nespresso has a machine that can do it. Look for machines that have features like a milk frother and ones that allow you to choose the strength of your brew and size of your drink. You’ll find that the VertuoLine offers a lot in the way of customization, but it is lacking in other areas. Looks – While not the most important consideration, you do need to buy a machine that you actually like. Be sure that it is a color you are fine with, and that the lines are pleasing to you. Space – While many of these machines are compact, not all Nespresso machines have a small footprint. You will need to verify that the machine you want is going to fit into the space you want it to go. Nespresso makes many different types of machines, but their capsules are where the magic really tends to happen. The capsules are made from recyclable aluminum, and the fresh ground coffee is hermeneutically sealed inside the to retain the freshness. When the capsule is later used, the coffee inside is just as fresh as it was the day it was packaged, retaining all the flavor and aroma of freshly ground beans. Other companies that are well known for their espresso machines have had difficulty perfecting the solution to brewing fresh grounds, and Nespresso has it in their capsules. Because of this, several espresso machine manufacturers and Nespresso have partnered up to create special machines utilizing technology from both brands and made their models compatible with Nespresso capsules. Because of this, you really get the best espresso experience available. You can find machines that are 100% Nespresso, from the machine itself to the capsules used, but you will also find machines from other brands. The most common brands that work with Nespresso are DeLonghi and Breville. You can find excellent machines made by Breville that are made to be compatible with Nespresso capsules, and the same is true for DeLonghi machines. When it comes to Italian espresso, DeLonghi and Breville are two makers who have a long history of knowing what they’re doing, so partnering with Nespresso was a no-brainer for them. 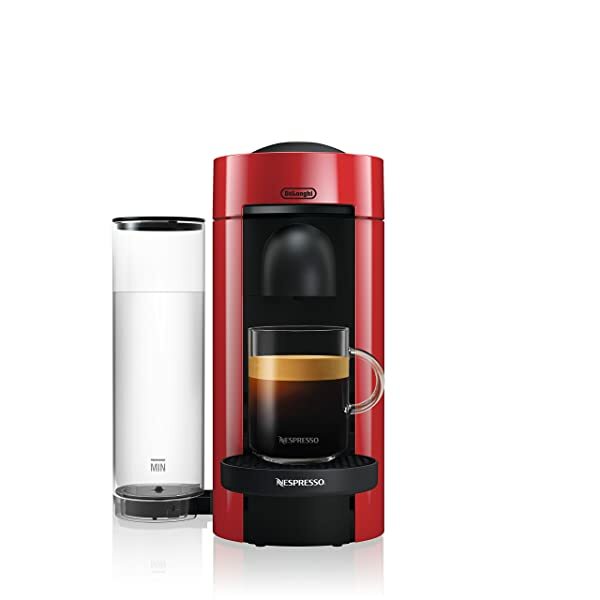 However, you will never find a machine that is a mix of Keurig and Nespresso, and K-Cup pods are not at all compatible with Nespresso machines, nor are Nespresso capsules compatible with Keurig machines. You have likely noticed that among all the Nespresso machines there are two different types. No matter who the manufacturer is, whether it be Nespresso, Breville or DeLonghi, the machines themselves fall under one of two models. 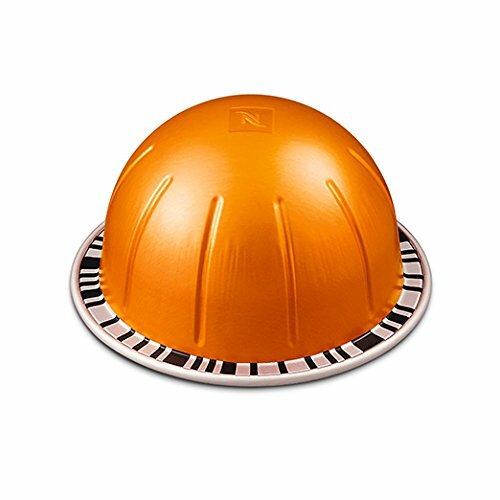 There is the Original Nespresso model that uses the original Nespresso capsules, and there is the VertuoLine Nespresso model that uses Vertuo capsules. There are similarities between the two machines, but there are also many differences between these models even though they are from the same company. The original line is well, the original one that Nespresso created. 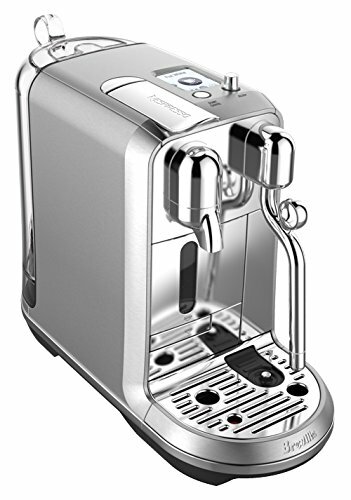 The Original line of Nespresso machines uses the standard pump technology found in most espresso machines. You’ll see that most of the Original line machines mention that they use “19 bars of high pressure” or something to that effect. This is the amount of pressure that is applied to the coffee to extract the flavor and aroma from the grounds. The Original line of Nespresso machines also uses high temperatures for extraction, brewing drinks that are hot and for a good price per capsule. When using an Original model, you can expect to spend around 75 or 85 cents per each Nespresso capsule. There are no barcodes on the Original capsules, and there are dozens of third party manufacturers creating these capsules for your use. The capsules for the Original line Nespresso machine are very easy to find and it seems like there are new options available almost every day. This type of machine can brew 1.35oz espresso and 3.70oz lungo sized drinks, but it cannot accommodate long coffees. Some of the Original line machines can also brew a .70oz ristretto shot. If you prefer dark drinks with little foam, you’ll probably prefer the Original line machine and capsules. The more authentic preparation of the drink creates a more authentic taste that can’t be beat. In 2014, Nespresso introduced their VertuoLine model to the world, and it quickly caught on. This model does not use traditional high heat and pressure to extract the flavors and aromas from your coffee. Instead it utilizes pressure created by centrifusion. Centrifusion is what happens when the Nespresso capsule in the VertuoLine models is rapidly spun in circles as water is forced through it. During this process, the water cools slightly so the resulting espresso is not as hot as you would expect it to be. Many times, it can also seem weak, with an artificially textured foam or crema. This is a modern and advanced way of brewing coffee, but it isn’t necessarily the best way. Nonetheless, a lot of people love it. When it comes to the cost per capsule, the VertuoLine is quite a bit pricier. You can expect to spend between 90 cents and $1.25 for each Nespresso capsule when using a VertuoLine machine. You should also know that there really isn’t much of a variety when it comes to the capsules for the VertuoLine machines. One of the things that was improved upon when the VertuoLine came out is the sizes of drinks that can be created. Especially in America, people wanted bigger cups of coffee, so Nespresso provided. With the VertuoLine of machines, you can create an espresso at 1.35 ounces, a double espresso at 2.7 ounces, a 5 ounce gran lungo, a coffee at 8 ounces and an alto at 14 ounces. To ensure that only genuine Nespresso capsules are used in the machine, the capsules for the VertuoLine have special barcodes on them that “talk” to the Nespresso VertuoLine machine. 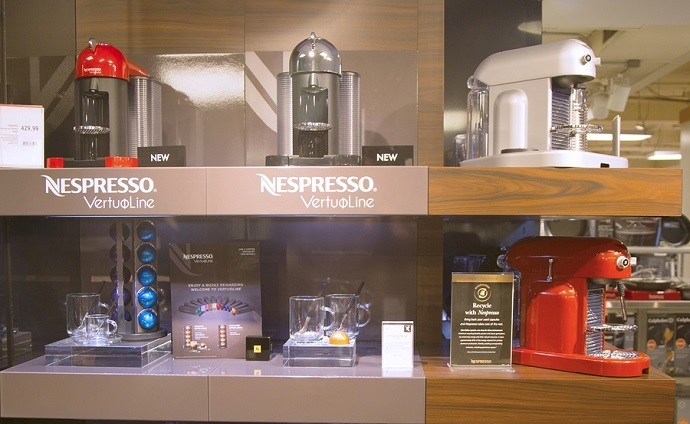 Additionally, if you have a VertuoLine machine, you can only purchase the capsules directly from Nespresso. They are not available for purchase in local retailers and are impossible to find online. This is just another way Nespresso ensures you are getting what you need from them and not spending your money elsewhere. One benefit to this barcode though, is that the lasers inside the machine can read the information on the capsule and know exactly what drink is being made. This allows the machine to use the right amount of water to make your drink regular or strong, and it also tells the machine how much milk to pour into your cup to make the perfect cappuccino with that specific capsule of coffee you are using. The VertuoLine can brew the traditional espresso and lungo drinks, but it can also brew a long coffee too. If you like creamier American style coffee drinks instead of the black European style coffees, then you’ll likely prefer the VertuoLine over the Original Line Nespresso machine. Many people have shied away from using the VertuoLine as of yet, for a variety of reasons. They want more variety in flavors, and the ability to choose where they get their coffee. VertuoLine machines offer a lot of control over the end product, though, so many people are beginning to come around. Think about your preferences before buying a Nespresso machine. These are a big investment and you don’t want to purchase the wrong one. We briefly discussed the capsules available for the Nespresso machine, but here in this section we are going to go into more detail. Remember that the Original and VertuoLine machines are very different, and so are their capsules. For the Original model of machines, you will find a wide variety of capsules to choose from, but for the VertuoLine model there just aren’t that many different choices right now. That might change in the future though, so be on the lookout if you own a VertuoLine Nespresso machine. Different people will have different preferences when it comes to their drinks as well. What is wonderful to us could be terrible to you and vice versa. You’ll need to try several different Nespresso capsule types and flavors before you find your favorites. For this reason, Nespresso actually sends a free welcome kit to everyone who purchases a new Nespresso machine. In this kit you can expect to find several different Nespresso capsules to sample in your new machine. This allows you to find ones that you enjoy without spending a lot of money on them. That being said, let’s take a quick look at some of the different types of Nespresso capsules you can expect to find. Espresso Capsules – These capsules tend to be more European in flavor and are a bit robust for the average American palate. This is a short coffee, meaning it is only brewed into a small cup. These capsules can be found in a range of strengths and there are four espresso varieties in Nespresso’s collection. Intenso Capsules – This capsule is a very rich blend. It is served short, even shorter than an espresso. You can have this in a ristretto glass. The resulting drink is almost syrup like in thickness. Nespresso has five blends of Intenso in capsules. Lungo Capsules – This type of capsule will brew a “long” coffee and will create a drink that is twice the amount that an espresso has. This drink is about the size of a tall coffee in a coffee shop. It is essentially an espresso shot that has ben slightly watered down, though not as much as an Americano. There are four blends available in this intensity. Pure Origin Capsules – These capsules are another variety of the espresso capsules, but the coffee in them is purely sourced. This means that instead of being a blend of coffees from multiple places, the coffee in these capsules can be sourced back to one place. Nespresso offers three capsules of this variety. Decaffeinato Capsules – As the name implies, these are the capsules for those of use who want coffee but not caffeine. Nespresso offers four delicious blends of decaf in their capsules. Other Capsules – If you like some flavor brewed in your coffee and espresso, look for the capsules that say “Variations”. These are the capsules in which Nespresso puts the flavor options they provide. You can find vanilla, chocolate and even caramel. Keep in mind that Nespresso capsules are not cheap. You can expect to spend nearly three times as much on a Nespresso capsule as you would on traditional ground coffee, but for many people this is worth it to use the machine that they’ve grown fond of. There are several different blends you can get for the Original line machine. You can choose from Arpeggio, Capriccio, Livanto, Ristretto and Roma. If you have no idea what there are, that is ok, we will briefly explain. These different blends have varying levels of intensity. Depending on your tastes, you might not like a level 9, but then again it might turn out to be your favorite. The Arpeggio is a robust blend that is a level 9 for intensity. This is one of Nespresso’s Intenso brews. The beans are long roasted, and you can taste chocolate undertones in the resulting espresso. The Capriccio is one of Nespresso’s most popular. This blend is rated as a 5 for intensity and delivers a kick. The espresso will have slight acidic tones, but it shouldn’t be off-putting. The Livanto is a blend that has a fantastically enticing aroma. Not only will the smell of coffee hit you full force, but there are hints of caramel as well. Livanto has almost no bitterness or acidity, and it is a 4 for intensity. The Ristretto is a blend that is full of flavor and richness. This is another of Nespresso’s Intenso blends. The beans in this blend were slow roasted and will taste slightly acidic with fruity undertones. Rated at a 10 for intensity, this coffee is a special one. The Roma is a mild Intenso blend. The coffee is strong but not overpowering and it has a balanced flavor. For intensity, this one is rated at an 8. It took a long time for coffee makers to be present on the kitchen counters of nearly every American home, and now with the Nespresso machines more and more homes are adding an espresso make to their list of appliances. If you love coffee shop coffee but hate the price, consider getting a Nespresso machine so that you can have barista style coffee in the comfort of your own kitchen and for a fraction of the cost. With the almost never-ending choices available, Nespresso has something for everyone. You can have simple to complicated, budget friendly or high end. You can brew plain espresso or a wide variety of specialty coffee drinks – and you can do it in your pajamas. We hope you found our guide to be informative, and that it answered any questions you might have had regarding Nespresso machines. We know that it has been a lot of information to take in. If you have any questions, feel free to contact us. Until then, happy brewing!